Looking for a dinner idea that’s a little different but still delicious? 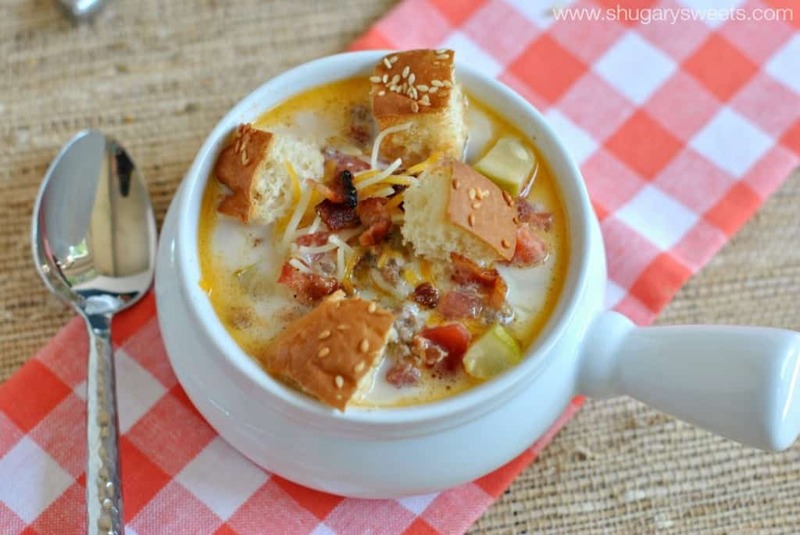 Bacon Cheeseburger Soup is made in 30 minutes, and will be loved by kids and adults! Dinnertime can be hard. And crazy. And chaotic. Or at least that’s what it’s like at my house! When my kids were little I used to dream of the day they were older and all the “free time” I would have to get a gourmet dinner on the table for my family. With four active kids, there is always someone coming and another going. However, most nights I do try to have dinner on the table for whoever is home. We sit down as a family, even if we might be missing one or two that evening. Soup is a great option for our busy family because heating it up for the “late arrivals” is a cinch! 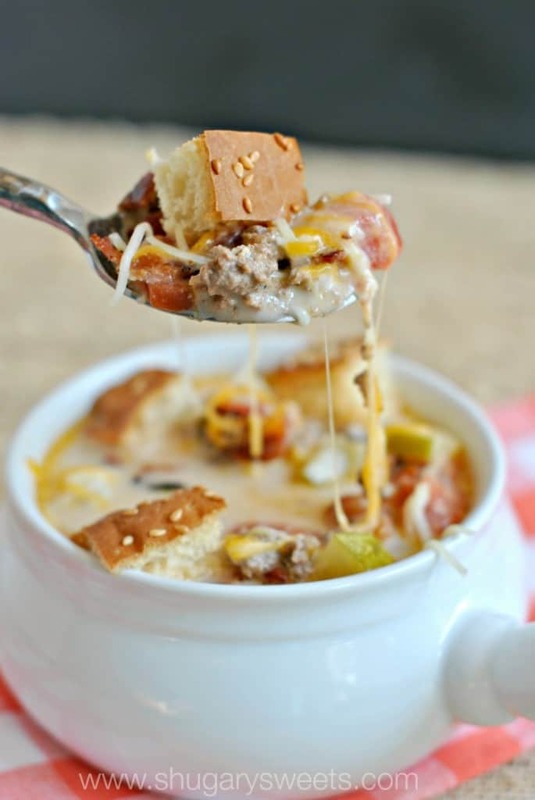 I’ve seen Cheeseburger soup all over pinterest…but of all the recipes I see they have potatoes in them. I’m sorry guys, but I don’t put potatoes on my burger. To prepare this mouthwatering meal, I started by frying up some bacon in a large soup pot. Cut your bacon into small pieces beforehand and it will only take a couple minutes to fry it up crispy. Remove the bacon from the pot and place it on a paper towel lined plate to drain. Drain your grease from your pot too before continuing. Add your ground beef to the pot, cooking until it is no longer red. Drain meat (and pot). I even gave my pot a quick rinse to get the excess grease out. Over medium-low heat, add the bacon and beef back to the pot (you can reserve a little of the bacon for garnish if desired). Add the tomatoes, mustard, pickles, beef broth, milk, crushed red pepper, salt and pepper. Cook for 10 minutes, stirring occasionally. While this is simmering, I bake up my diced hamburger buns. They take about 8-10 minutes to brown in the oven. Add your cream and cheese to your soup, heat until it’s warm (about 2-3 minutes). Serve with your toasted buns and garnish if desired. ENJOY!! This TRULY tastes like you are eating a bacon cheeseburger! Love pot pie? This Beef Pot Pie Soup is a take off your favorite comfort food, complete with the pie crust topping! Ditch the cans and make your own Roasted Tomato Soup from scratch. 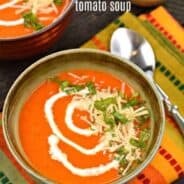 I’ve got all the tips on how to use fresh tomatoes in your soup! Comfort food. That’s exactly what this One Pot Chili Mac is all about! Delicious, easy, and perfect for busy weeknights! 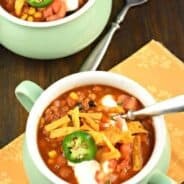 This Instant Pot Chicken Taco Soup from Wine and Glue is your very favorite slow cooker taco soup, but made in the pressure cooker! 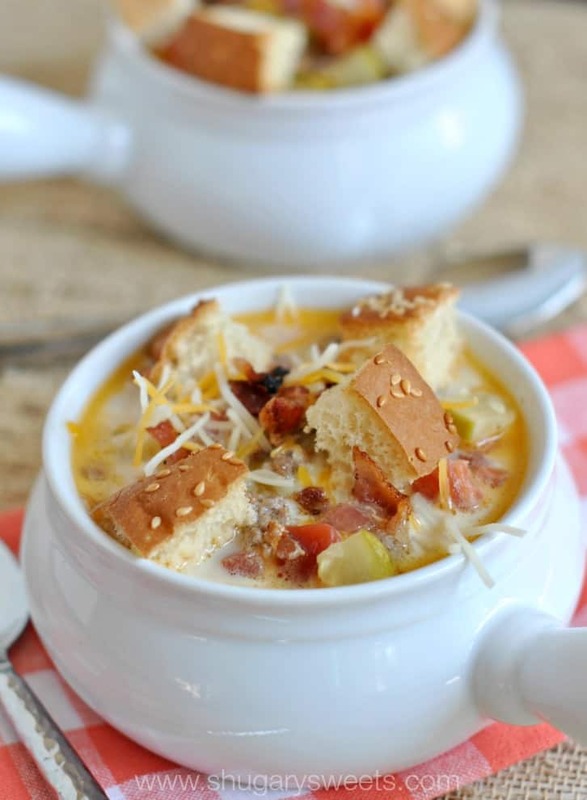 Loaded Baked Potato Soup Recipe for the Crock Pot Slow Cooker is the best way to make simple creamy potato soup, and with no milk or cream! Thank you Mama Loves Food for this delicious dinner! Looking for more meals under 30 minutes? Here are a few favorites…. 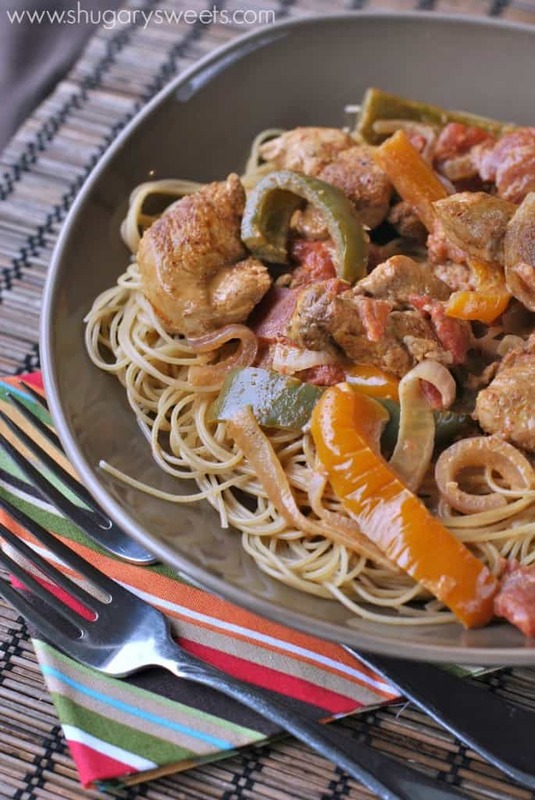 Cajun Chicken Pasta: one of husband’s favorite dinners!! 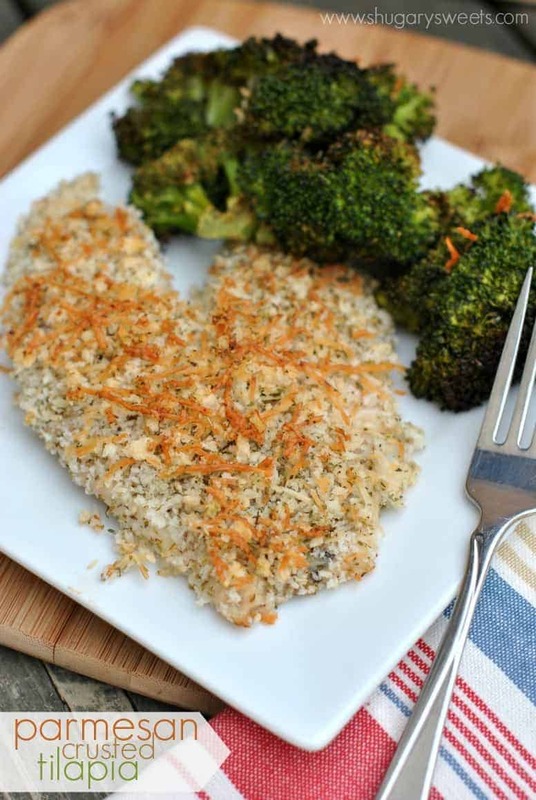 Parmesan Crusted Tilapia: forget the frozen fish and make a meal your family with love! 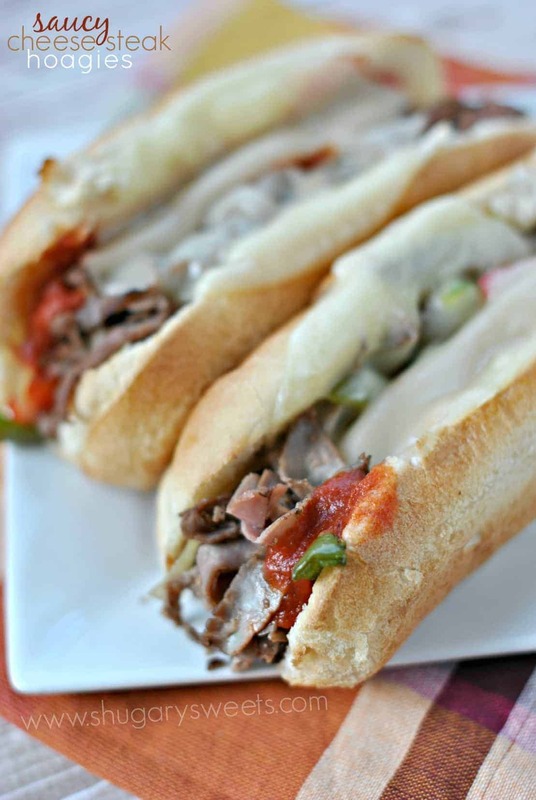 Saucy Cheesesteak Hoagies: easy meal using deli roast beef! Dinner’s got nothing on you. In a large soup pot over medium high heat, saute bacon pieces until browned (I like it crispy, it takes about 4-5 minutes). Remove bacon and place on a paper towel lined plate to drain. Drain grease out of pot. To the pot, add the ground beef and cook until browned. Drain and return beef and bacon to pot. (make sure all the grease is out of the pot). Add tomatoes (with juice from can), mustard, pickles, beef broth, milk, red pepper, salt and pepper. Simmer over medium-low heat for about ten minutes, stirring occasionally. While this is simmering, place hamburger bun pieces on a baking sheet and bake for about 8-10 minutes. To the soup, add heavy cream and cheese. Heat for about 2-3 minutes, until cheese is melted. Serve in soup bowls with hamburger bun croutons! 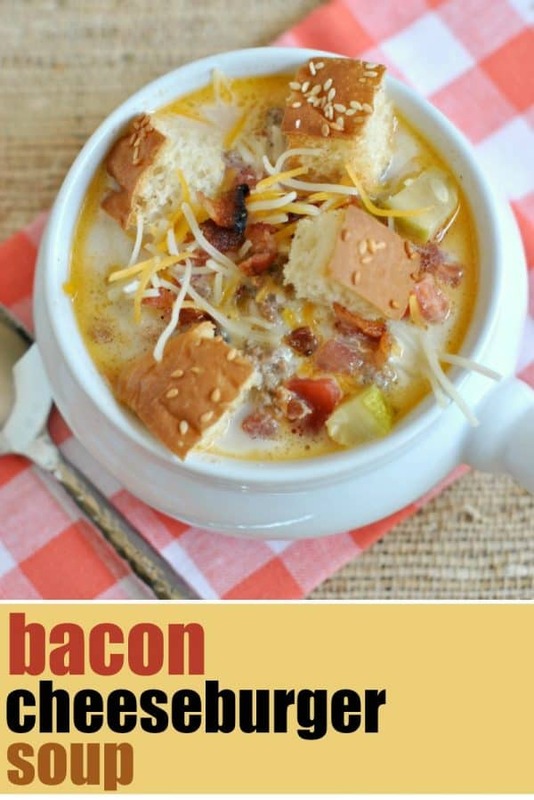 *Today’s recipe for Bacon Cheeseburger Soup was originally published on Shugary Sweets on September 25, 2014 and has been republished in May 2018. This looks amazing. I have no doubt it would be a hit in our house. My burger craving just took a new form! I love that you even incorporated the sesame bun in here! Looks delicious! I absolutely agree – soup is great for busy weeknights! this cheeseburger soup needs to happen in our house soon! Pinned! Free time? What’s that? My social schedule now revolves around my kids schedules. Not to mention trying to get dinner on the table. We are soup lovers -this is on the menu for next week! 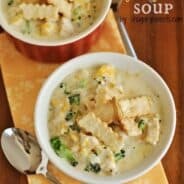 This soup looks so creamy and hearty. I have my spoon ready. Pinned. 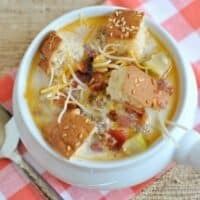 I’ve been meaning to make a cheeseburger soup for YEARS! Yours looks amazing!!! Definitely whipping some up soon with this chilly Fall weather we’ve been having! I want to dig right in, amazing Aimee! I have never seen this before…but, it is very enticing. It would hit the spot on a busy night! Thanks Marjory! It was really delicious, and perfect for a crazy night! This looks so delicious! I’ve never heard of cheeseburger soup before. I must try it asap! Weeknight meal game changer…I’m all over this!! I love the bun croutons – genius! Aimee, I’m still dreaming of that time too. I think it may come when we have an empty nest, but then we’ll probably be wishing for kids in our house again. Maybe:) Thanks for sharing this easy soup; I’m sure my family’s going to love it! Oh empty nest. That sounds sad too!! MMM! I can taste that juicy burger now! Love that your soup doesn’t have potatoes in it! Perfect for busy weeknights! Oh my goodness! This soup sounds awesome, Aimee! I need a big bowl in front of me right now! What a fun soup! My kids indeed would love this. I’m in full soup mode right now! Hmm, you had me at bacon … and the rest of the family at cheeseburger. Gorgeous photos and genius idea Aimee! Thank you Sarah, you’re too sweet!! I’m so glad you liked the soup! The pickles are a nice touch, right??? Have a great day! I made this soup about a week ago and it was SO yummy! My hubby loved it. I passed the recipe on to my mother who made it for my dad and brother and they loved it as well. I think my favorite is the pickles in the soup. I’m pregnant and I have to say pickles in anything is delicious so this was a craving filler for me! I’m making it again tonight and have shared your link on my facebook as well! This recipe is the BOMB! Tastes exactly like a Smashburger or Five Brothers cheeseburger. Not kidding. The whole family LOVED it. 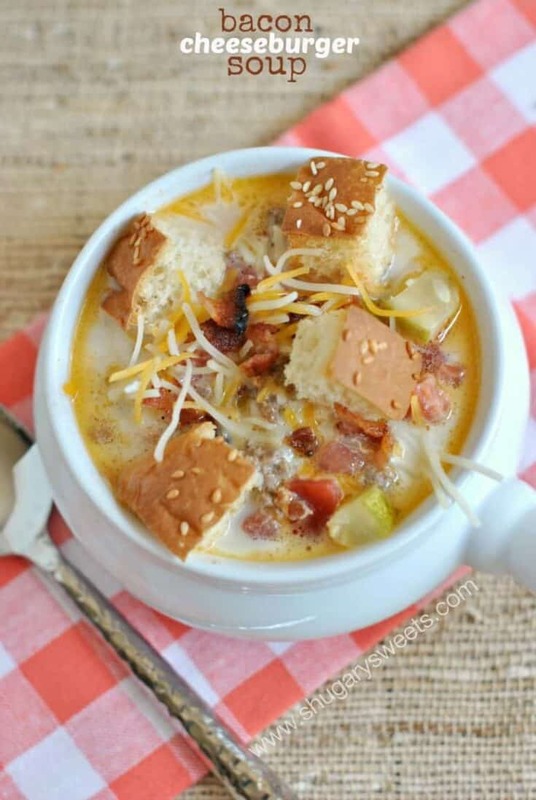 Great football day party soup. haha, so glad you loved it!!! It’s so easy to make! Oh, hello, new favorite soup! I’m so glad to find a cheeseburger soup recipe without the bulk of it seeming to be potato so thank you!